FAKRO has equipped its products with a revolutionary radio communication system named Z-Wave. This is a wireless protocol used for communication between household appliances. As one of the most innovative companies in Poland, FAKRO uses a revolutionary radio communication system called Z-Wave in its products. This allows you to create a single network by combining a range of electrical devices such as: lighting, thermostats, alarms, computers, telephones, air conditioning and electric windows and blinds. Currently, there are over 200 manufacturers of electric household devices associated in the Z-Wave system (amongst others: Intel, Panasonic, Apple, General Electric). The Z-Wave system is also ideal in individual building elements, e.g. FAKRO roof windows, Wayne-Dalton garage doors, Danfoss heating systems or Osram lighting devices. Every single electrical device produced by FAKRO contains its own electronic module incorporating the Z-Wave chip. This enables the creation of wireless networks and the ability to control devices with the Z-Wave module with the use of a wireless keyboard, remote control and, also mobile phones or the Internet in the future. 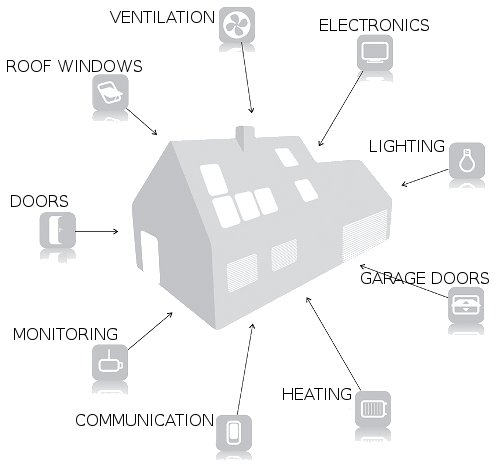 FAKRO products can be connected across the Z-Wave network: Z-Wave windows, standard roof windows equipped with motors containing Z-Wave modules, ARZ Z-Wave external roller shutters or internal accessories such as AJP Z-Wave, ARF Zwave or ARP Z-Wave. The Z-Wave system is easy to install, expand and manage. Installation of the system does not require any control units or fitting wires between electronic devices. This means a significant reduction in the cost and time of installation, while providing maximum convenience for the user. It can be installed in buildings under construction as well as in already completed properties. The operating principle of this system consists in “mapping out a route” for a signal. For radio waves sent from a controlling device (e.g. remote control) there is set route that ensures all commands reach the right device and it performs the correct action. This is achieved through the confirmation of command request which has been sent out by a device, which in this case is a remote control. If there is an obstacle in the way of the radio waves and signal cannot reach the device to which the command was directed, the Z-Wave system searches for “a new route” to a given device. The new route leads through other devices in the Z-Wave network. It is this feature which ensures high system reliability. This means that the Z-Wave protocol can have a virtually unlimited range as when you send a command with a remote control, it uses other devices in the network, thus contributing to a reduction in energy consumption as well. The whole Z-Wave protocol is contained in a single small chip.